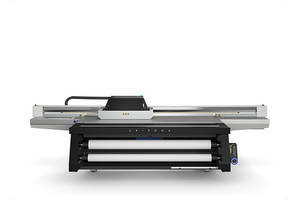 MELVILLE, N.Y., Feb. 4, 2019 - Canon U.S.A., Inc., a leader in digital imaging solutions, is pleased to announce the launch of the new Océ Arizona 1300 series of high-productivity mid-volume UV true flatbed printers. With its innovations in print speed, ease-of-use and curing technology, the Océ Arizona 1300 series is extremely versatile allowing print providers to do more, do it smarter, and do it now. Canon U.S.A., Inc., is a leading provider of consumer, business-to-business, and industrial digital imaging solutions to the United States and to Latin America and the Caribbean markets. With approximately $36 billion in global revenue, its parent company, Canon Inc. (NYSE: CAJ), ranks third overall in U.S. patents granted in 2018 and is one of Fortune Magazine's World's Most Admired Companies in 2018. Canon U.S.A. is committed to the highest level of customer satisfaction and loyalty, providing 100 percent U.S.-based service and support for all of the products it distributes in the United States. Canon U.S.A. is dedicated to its Kyosei philosophy of social and environmental responsibility. In 2014, the Canon Americas Headquarters secured LEED® Gold certification, a recognition for the design, construction, operations and maintenance of high-performance green buildings. To keep apprised of the latest news from Canon U.S.A., sign up for the Company's RSS news feed by visiting www.usa.canon.com/rss and follow us on Twitter @CanonUSA. For media inquiries, please contact pr@cusa.canon.com.